They say beets are an acquired taste, but after I learned that beets were so easy to grow I knew I just had to find a really healthy way to use them. And boy did I. After I learned how to make the best beet kvass recipe in the world I fell head over heels in love. Seriously if you could be a fly on the wall in my home and you see me enjoying a wine glass full of a dark purple drink, well, it ain’t wine. Nope, it’s just my beet kvass. I usually get eye rolls from my kids, but it’s all good. And YES, they will drink it too. High five, team mom! (as I high five myself). Beet kvass is a fermented drink that has a lineage that goes as far back as the middle ages. According to the Weston A Price Foundation, Beet kvass was of a more medicinal purpose while other Kvass recipes were also enjoyed. Many fermented recipes can be made with whey (a seperated part of fermented milk). However, this fermented beet kvass recipe is without whey. For this simple yet amazing beet kvass recipe, all you need is water, sea salt or Pink Himalayan salt and of course beets. Beet kvass what is it and just exactly why would I call it the healthiest drink in the world? It is a powerhouse for the digestive system as well as overall gut health. detoxifying– This age-old tonic owes much of its acclaim to the fact it detoxifies so extremely well. alkalizing– Beet kvass is one great and easy way to move the body to a more alkaline state to promote health and reverse states of ailment and disease. balancing– In our highly processed culture, our bodies often get off balanced with over processed food. Bringing them back to a healthy balance helps the body deal with things like hormonal imbalances, sugar addictions or candida overgrowth. nutrient enhancer– Beet kvass does carry a lot of healthy nutrients, but the magic that it really does is it allows your body to better utilize and absorb the nutrients it is already consuming, giving you an extra boost without another supplement pill. Of all the great things we have talked about here today as far as beet kvass goes, the best thing might just be how easy this is to make. I’m serious. A glass jar, water, salt and of course beets and your good to go! Take yourself 2-3 medium-sized beets, peel and chop into good 1-inch pieces, place in a half-gallon or split between 2 quart jars. 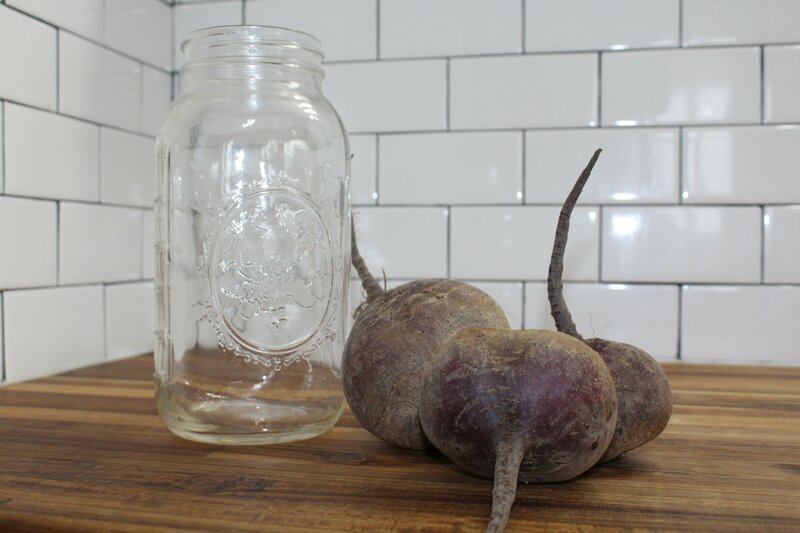 Pour salt water over beets, cover the jar with cheesecloth or fermentation lids. I personally like mine on the stronger side. I tend to let mine go closer to a month, but test it out and see what it is you like. Adjust and find that perfect kvass level for you! 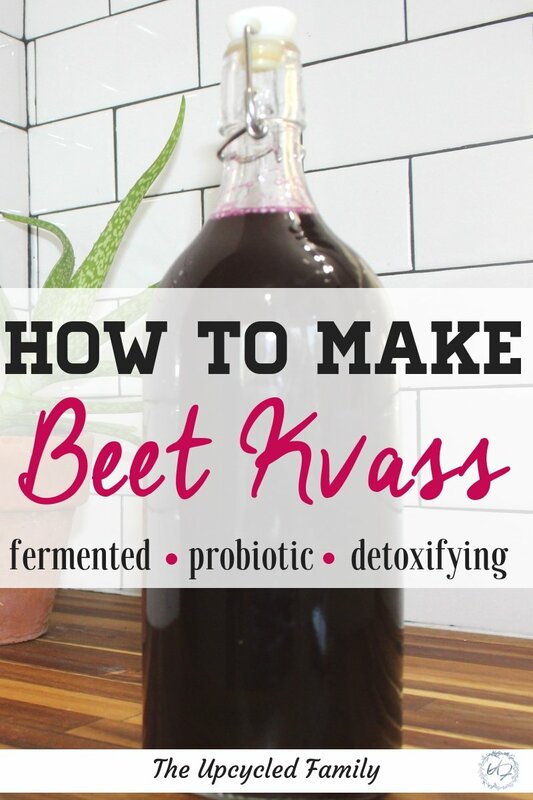 This super easy and amazingly healthy Beet kvass recipe is fermented and full of probiotics and wonderfully detoxifying. Take yourself 2-3 medium-sized beets, peel and chop into good 1-inch pieces, place in a half-gallon or split between 2 quart sized jars. Let set on the counter out of direct sunlight for 1-4 weeks. The longer you let it ferment the stronger it will be. When it has fermented to your desired level, bottle, and store in the fridge! P.S. Looking for more health-boosting goodies? Sign up and become part of The Upcycled Family community for regular doses of healthy recipes, homegrown goodness, simple living ideas, and inspiration.